Magnificent Desolation: Walking on the Moon 3D is a 2005 IMAX 3D documentary film about the first humans on the Moon, the twelve astronauts in the Apollo program. It is co-written, produced and directed by Mark Cowen, and co-written, produced by and starring Tom Hanks. The film includes historical NASA footage as well as re-enactments and computer-generated imagery. Tom Hanks is the narrator, co-writer and co-producer. 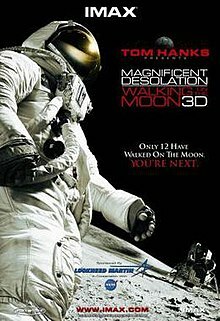 Magnificent Desolation is the third Apollo-related project for Hanks: he was previously involved in the film Apollo 13 and the miniseries From the Earth to the Moon. The cast includes Andrew Husmann, Aaron White, Brandy Blackledge, Gary Hershberger, and Scott Wilder. The voice cast includes Morgan Freeman, John Travolta, Paul Newman, Matt Damon, Matthew McConaughey. Bryan Cranston and Peter Scolari reprised their From the Earth to the Moon roles as Buzz Aldrin and Pete Conrad, respectively; many of the other actors had previously portrayed different people depicted in the film, in From the Earth to the Moon, The Right Stuff, and/or Apollo 13. Score by James Newton Howard and Blake Neely. The film was released in IMAX theaters on September 23, 2005. It was released on DVD on November 6, 2007. Armstrong: Isn't that something! Magnificent sight out here. On February 16, 2006, Jack Geist, Johnathan Banta, and Jerome Morin received the award for Outstanding Visual Effects in a Special Venue Film from the Visual Effects Society for their work on the film. ^ "Magnificent Desolation (IMAX) (2005)". Box Office Mojo. Retrieved June 3, 2016. ^ In George Pal's 1950 film, Destination Moon, the moonwalkers are asked, "Can you give us your first impressions of the moon?". Dr. Cargraves (Warner Anderson) replies, "Well, I'll try. The first impression is one of utter barrenness and desolation." The movie was loosely based on Rocket Ship Galileo by Robert A. Heinlein, who also helped write the script. In the book Heinlein describes the Moon as "a scene of blistering desert desolation". ^ Apollo 11 Lunar Surface Journal "One Small Step"